I never finished sharing all of the details of Evan’s Pokemon party that I made Pokemon invitations for. There were a couple of fun Pokemon party games that I came up with that I still wanted to tell you about. I think it’s really neat that the new generation can enjoy something that we enjoyed as children, and I had a lot of fun with this party! 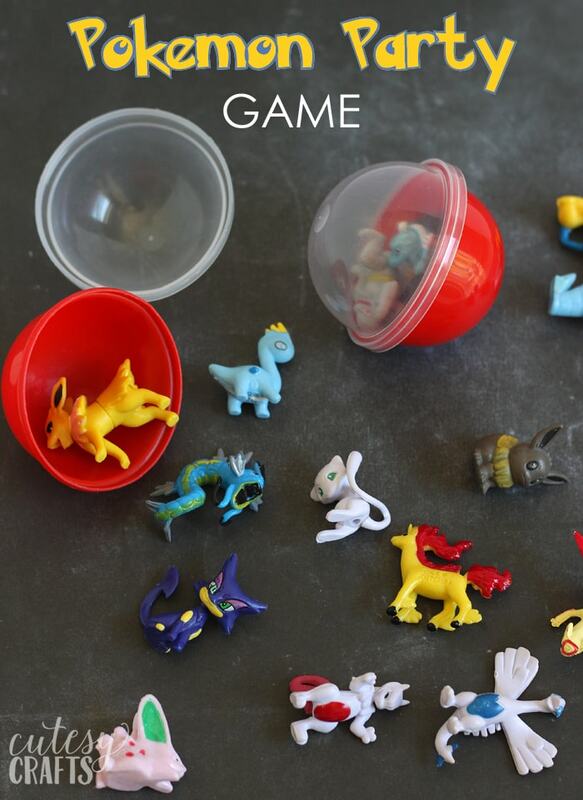 I’ve got a couple of games here, Pin the Tail on Pikachu and a fun Pokemon hunt game. The first game at the party was a fun Pokemon hunt. 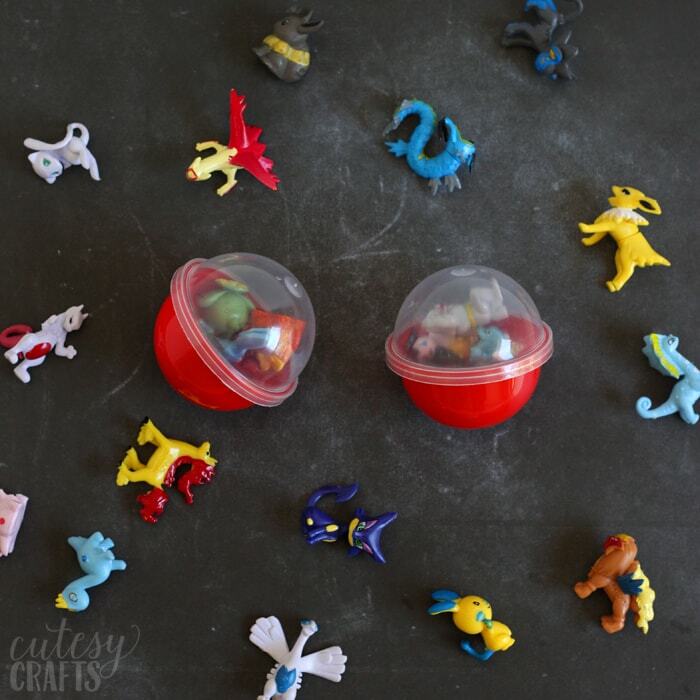 I filled a bunch of red vending machine capsules with little Pokemon figures and hid them all around the yard. Just like an Easter egg hunt, I gave each of the kids a bag and they searched for the capsules. I bought the Pokemon figures here on Amazon. This was also the party favor, so I felt it was okay to splurge a little. It came with 144 figures, so definitely worth it! I bought 25, 2″ round vending machine capsules from an ebay seller. I asked him to send me all red ones so they would look like Poke Balls, and he was happy to. Perfect! If you have a lot of kids coming to the party, you could probably do 50 capsules as well. I put quite a few Pokemon figures in each one, so you could split them up more. The boys had a great time on their Pokemon hunt and were so excited to see which Pokemon they caught. I also found these capsules that look just like Pokeballs, so that’s an option for you. The other game that we played was Pin the Tail on Pikachu. Simple but fun! You can print the Pikachu and tails as multiple, tiled sheets to tape together, or you can also print it smaller on a single 11×17 piece of paper. I usually print this size on the copy machine at Staples. It’s very inexpensive. The tails for this size will fit on 8×10 sheets. Evan got a Nerf crossbow as a gift, and Pikachu doubled as target practice later on in the party. So there’s a bonus game for yah. Haha! 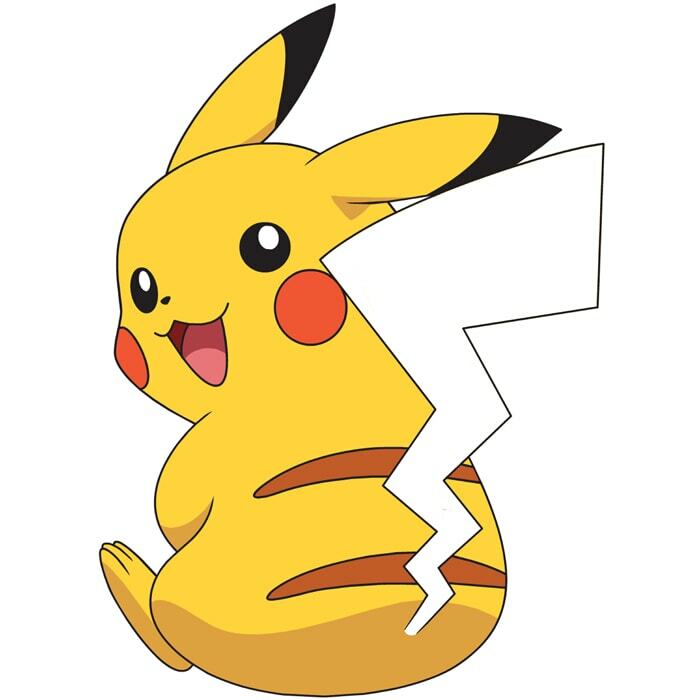 To get download the free Pin the Tail on Pikachu printable, enter your information in the form below or click here to subscribe to my newsletter. It’s free, and I’ll keep your email address safe. You can also unsubscribe at any time. That’s it for our Pokemon party games. Be sure to check out the invitations that we made and the craft that we did at the party. I also made some fun printable Pokemon valentines that you can download. 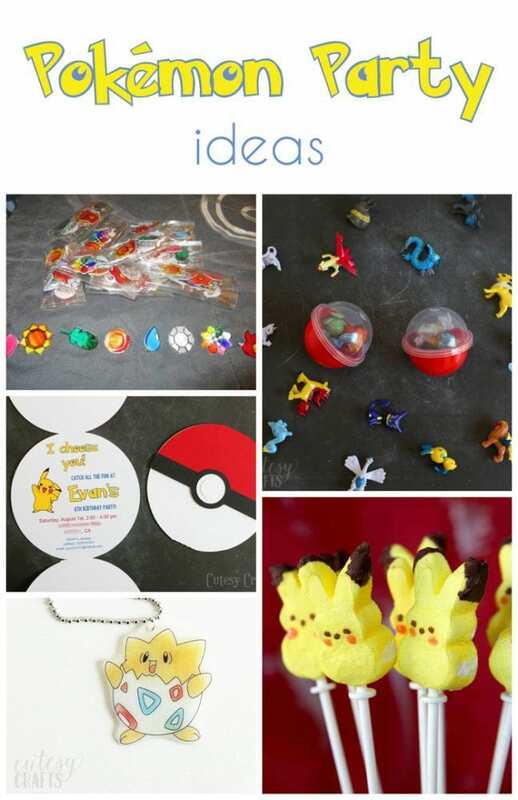 Also be sure to check out these other Pokemon Party Ideas! Many thanks for the ‘pin-the-tail on the Pickachu’ template! I was about to give up and draw one by hand and believe me no-one wants to see that! I subscribed and still having trouble getting the download for the pin the tail Pikachu? Just sent you an email. Let me know if you don’t get it. I’m having the same issue with the Pin the Tail on Pikahcu – can you please send it to me too? I tried to subscribe too! I would like the pikachu pin the tail. Thanks! When you signed up, you should have gotten an email asking you to confirm your subscription. Once you click that link, you will get another email that will contain the link to the files. Let me know if you have any problems with that, and I can help. I can’t find those capsules on Ebay. Do you have a link or the seller’s ID? I will email it to you. Let me know if you don’t get it. Got it thanks! 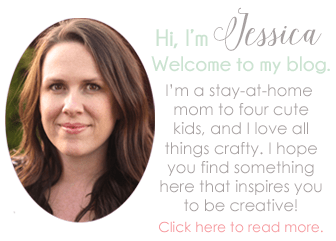 Just wanted to let you know that I love your blog. Glad i came across it while planning this Pokemon party. Hey could you please send me the tail for the Pikachu or maybe add a link to download here, seems many people need that! Was going to make one somehow, but the scale may be off. Much appreciated and love your ideas! I just subscribed and I can’t figure out how to get the Pikachu Pin the tail game? Weird. Did you get it to work yet? If not, shoot me an email at cutesycrafts at hotmail, and I will email you the file. I can not download the pin the tail on pikachue. Send me an email at cutesycrafts (at) hotmail, and I’ll send it over to you. I subscribed about a week ago and am bit able to access the Pikachu pint out. Would you be willing to share it? Yes, send me an email at cutesycrafts@hotmail.com, and I will send it your way.